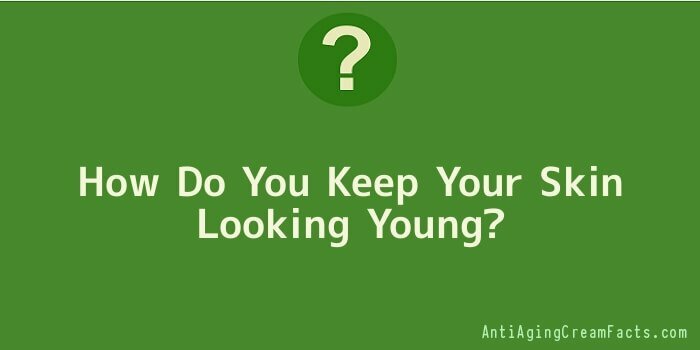 Skin ages just as any other part of the body, but there are some things a person can do to keep skin looking young despite chronological aging. Dull, dry, or wrinkled skin can all make a person appear much older than they really are, and some simple tips can help to remove years of age from the skin. The most basic is to keep skin healthy through daily washing and care. Basic hygiene is as important to the skin as it is to general health. Using acne products or skin care creams may benefit the health and appearance of skin. Exfoliating, which is the process of scrubbing skin to help it shed layers of dead skin on the exterior, is crucial to skin health, and adds life to your skin as dead skin cells are removed. Ingredients like hydroxyl acids can help to gentle encourage skin to renew itself faster. The shedding time of old skin slows down with age, so it is important to give the body a boost through exfoliation. Skin hydration is also important to add lustre and shine to skin. The best time to moisturize is right after exfoliation, because the new skin cells are fresh and have nothing to block the absorption of moisturizing agents. After moisturizing, take care to wear sunscreen so that the new shine gained does not get overshadowed by sun damage. Take care to control stress levels, as these impact not only overall health, but also skin health. Production of hormones caused by constant worry or stress eats away at the skin’s nutrients, causing it to look dull and unhealthy always. Lack of sleep can do the same. A poor diet can also rob the skin of nutrients needed to stay healthy. Use sunscreen and avoid the direct sunlight, as the UV rays in it damage the skin. Sunscreen can be obtained with moisturizing agents or vitamins that help to nourish skin as well as protect from the sun. To make choosing a skin care product easier, there are certain active ingredients that when used in creams, washes, or lotions can improve the look and quality of skin. Each of these ingredients has their own benefits. Antioxidants are an important ingredient to many skin care products and help to reduce wrinkles and lines in the skin due to sun exposure, aging, or other factors. Other ingredients to look for when examining active ingredients of skin care products are peptides, hydroxyl acids, coenzymes, and vitamins A, C, and E.